The spicy, musky scent of autumn rolled over my town, and I could feel the veil between the worlds getting thinner. 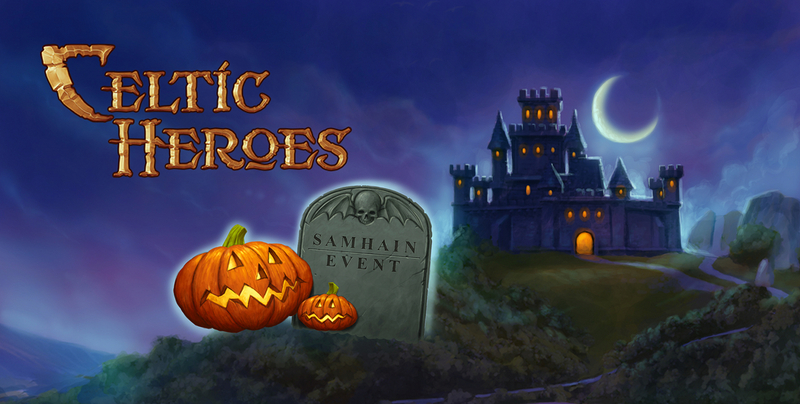 The 2012 Samhain Event is set to be released next week. Read below for more information. Samhain is a Celtic festival dating back over 2000 years which when translated means “End of Summer”. It celebrates the end of the harvest season and marks the beginning of the ‘darker half’ of the Celtic year. During Samhain the barriers between the world of the living and the world of the dead, the Thin Veil, weaken and allow spirits to enter our world. Whilst other people may celebrate Halloween during October, here at Celtic Heroes we follow the Celtic traditions and as such we celebrate the festival of Samhain throughout autumn. The Halloween that we all know today actually originates from Samhain, which is why we are using the festival as the basis of our event. Therefore, we are delighted to announce that next week we will be launching our Samhain event, and that it will be running throughout the months of autumn until December. Over the weekend I will be posting some additional information, including what content is going to be introduced in celebration of Samhain and a small post detailing some of the history behind the festival, so keep an eye out for that! In the meantime, why not tell us how you are planning on celebrating Halloween (the modern version of Samhain) this weekend? Are you going trick or treating? Perhaps you’ll be bobbing for apples? Leave a comment and let us know! You can also discuss our Samhain event over in the game forums, where we’ve created a special topic which is dedicated to this year’s Samhain event. You can find this topic by clicking here. We can’t wait to share with you what we’ve got planned for Samhain, and we hope that you are looking forward to it as much as we are! Sounds interesting! Must be a great event seeing that there is a whole background story I’am so keen! I think there should be a quest similar to the lugh mask quest during the summer event. Make a ultra rare drop in each zone. Weapon armor and so on.. If you want to tank than use a warrior. People choose ranger because they are a well rounded class. If they switch it up then the need for strength would not exist for a ranger. Dexterity is the rangers best friend. We were not meant to be tanks even though if done right you can be a powerful player. Please do not switch these as I am sure a lot of rangers would be upset with it. Awesome! I am very excited 🙂 some very interesting celtic lore surrounding the festival of Samhain.